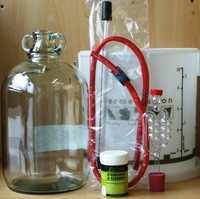 A complete equipment starter kit containing everything you need (except ingredients) to make your first batch of country wine at home. The kit is purely an "Equipment Set" and DOES NOT include any recipes, yeasts, chemicals or ingredients. The bucket can be used to crush and/or steep your ingredients and can also be used for primary fermentation prior to racking off the must into the demijohn for clearing and storage. Depending upon what is available from our suppliers, the 10ltr bucket may be the graduated one shown above, but this may be substituted for one made of plain white, heavy duty, food grade ungraduated plastic. To make wines directly from your grapes or to make country wines from fruit or vegetable ingredients, you simply use the large bucket to crush the grapes/fruit to extract the flavour and colour, before adding yeast and undertaking a primary fermentation. Once the early rush of fermentation has subsided, you can syphon or strain the "must" (the fermenting juice) into the demijohn and allow it to continue its fermentation/clearing/maturing process as per your recipe. As different base ingredients have different characteristics and require treating in different ways such as using pectolase and amylase, varying the length of steeping, acidity adjustment, the addition of extra sugar etc, it is impossible for us to give a definitive "Step by Step" guide for the process and we would, instead, recommend that you acquire a copy of CJJ Berry's wonderful book, "First Steps in Winemaking".